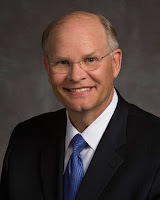 Elder Dale G. Renlund (born November 13, 1952) served in the First Quorum of Seventy starting in 2009, until his call to the Quorum of Twelve in October 2015. "[T]he Savior said that He 'cannot look upon sin with the least degree of allowance' (D&C 1:31); so how can He look at us, imperfect as we are, without recoiling in horror and disgust? "Our Good Shepherd is unchanging and feels the same way today about sin and sinners as He did when He walked the earth. He does not recoil from us because we sin, even if He on occasion must think, 'But what a sheep!' He loves us so much that He provided the way for us to repent and become clean so we can return to Him and our Heavenly Father (see Articles of Faith 1:3). In doing so, Jesus Christ also set the example for us to follow—to show respect to all and hatred toward none. "As His disciples, let us fully mirror His love and love one another so openly and completely that no one feels abandoned, alone, or hopeless." 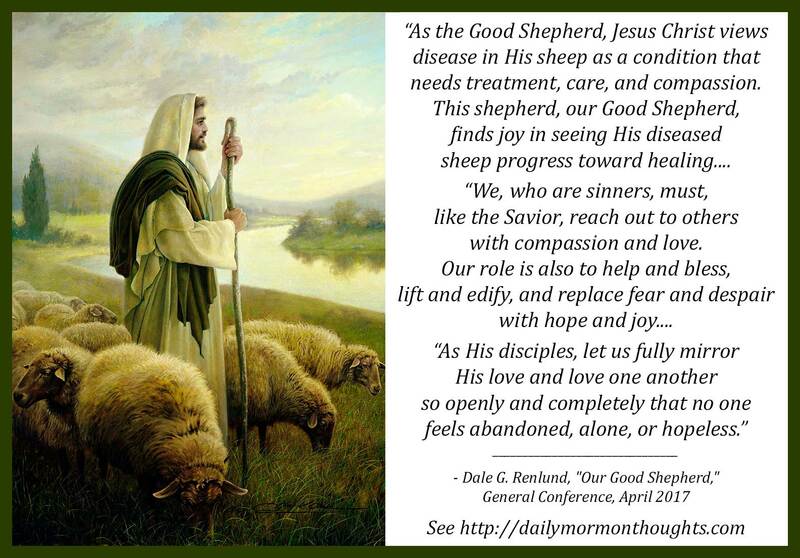 I very much enjoyed Elder Renlund's considerations of the imagery of the Good Shepherd. I think he asked some interesting questions and looked at the story in unusual ways. A shepherd doesn't despise his sheep when they are ill or injured; quite the contrary, he loves and nurtures them with loving caring until they are well again. Why should we feel any lack of God's love for us when we have made mistakes in life? The "immense compassion" felt for us by both the Father and the Son should inspire us with confidence and hope as we deal with our own "disease" conditions. In addition, they are models about how we should treat others in our sphere who are different or especially who are struggling. Reaching out to others is not an option in Elder Renlund's view. "Our role is also to help and bless, lift and edify, and replace fear and despair with hope and joy." A true disciple will live and act like his Master as we strive to "fully mirror His love and love one another so openly and completely that no one feels abandoned, alone, or hopeless." Thanks for sharing, and allowing the post to social media.